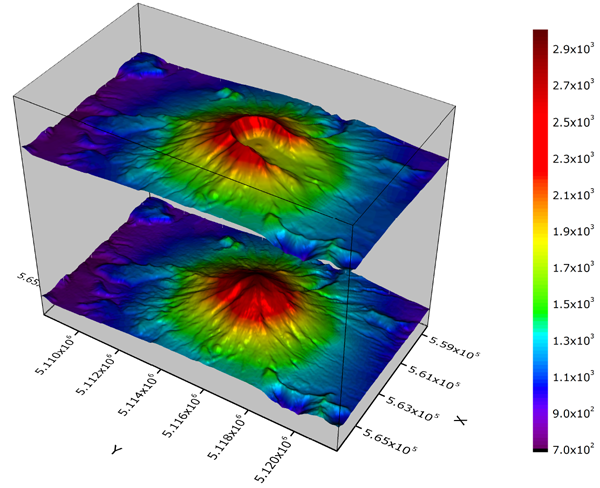 This graph consists of two 3D surfaces with color map, showing the topology of Mount St. Helens before and after its catastrophic eruption on May 18, 1980. The graph layer contains two matrix data plots. The matrices “before” and “after” are used to plot the images of the volcano before and after its eruption. The second plot is shifted along the Z axis to allow easy viewing of each surface.